Get gym quality training right in the comfort of your own home with the compact design and versatility of the Marcy MWM-990 Home Gym. This all-in-one gym machine provides over 30 strength training exercises for the total body. This complete gym system is constructed from heavy duty steel and offers a variety of functions for a total workout. It features a 150 lb selectorized weight stack, a dual functioning press arm, adjustable preacher curl bicep pad and comfortable roller pads. The Marcy MWM-990 also offers adjustable butterfly attachment and leg developer for an easy way to change up your fitness routine. There’s also an overhead lat station for back, abs and triceps exercises and a low pulley station for curls and rows. Muscle building and toning is definitely going to be an easier part of your routine with a Marcy MWM-990 Home Gym. Click here to see the price of the Marcy MWM-990 Home Gym Machine on Amazon. Overhead lat station for back, abs and triceps exercises with adjustable preacher curl pad. Solid steel weight stack enclosure with 150 lb selectorized weight stack. Shipping costs will vary for the Marcy MWM-990 Home Gym depending on where you purchase from and what type of delivery you prefer. However, some retailers, such as Amazon.com, may provide free shipping. The MWM-990 Home Gym isn’t too difficult to assemble. The directions could be better, but compared to other home gyms the overall level of difficult isn’t bad. There aren’t as many pieces with this home gym that you’ll find on others. In all, assembling the MWM-990 Home Gym should take about 4 hours. It’s awesome that you can find a complete total gym in this price range. For the price of an annual gym membership, and in some cases less, you can get your own home gym. This means no more crowded gyms, or waiting on equipment, or stares from other people. 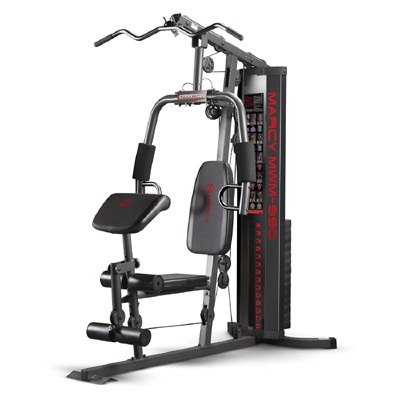 This Marcy MWM-990 provides over 30 strength training exercises for the chest, back, lats, abdominals, arms and legs. The 150 lb weight stack provides good resistance and about as much weight that you can expect in this price range. If you’re looking for a little more weight, the Weider Home Gym uses an 80 lb weight stack but claims to provide up to 214 lbs of resistance. You can check out our review of this home gym on this site. A common comment with these lower end gyms is that they exercises don’t fit everyone perfectly and that’s the case with the Marcy MWM-990. It’s the price you have to pay for a budget-friendly and more compact home gym design. If you’re six feet or over, you may not be fit comfortably in exercises that use the leg developer or the chest press. With a smaller general footprint, the MWM-990 was clearly designed for the average person. If you’re taller, your range of motion on some exercises may be restricted. If you’re on a budget or just looking for your first home gym, the Marcy MWM-990 is a good choice. This gym provides a full body workout for a very reasonable price. The 150 lbs weight stack is good and you’ll be hard pressed to find much more options at this price. The real drawbacks of this home gym is that it might not fit taller users that well, but again it’s a trade off for a lot of compact design home gyms.